** spoiler alert ** “The author keeps you starving for more action with impossible plot twists and turns. If you loved Rick Rioderns Percy Jackson series, then you’ll crave GODS AND WARRIORS.” _Stanly Benson. The story takes place over three thousand years ago, before even the Greek gods were fully formed. It’s set in the Bronze Age; a time when people still ate raw meat and fish -occasionally cooking it if they had time, when Kronos and his brothers were still very much alive. What held my attention most was the fact that a thirteen year old child was plunged into the dealings of the gods -another pawn for them to show their supremacy over mortals. There was never a dull moment throughout my time reading, my heart rate went up with apprehension. Several times I tried to guess the outcome of several impossible situations, yet, the author somehow created a loophole the saved the day. Twice the main character faced death, each time, I was certain of his death; yet he proved his resilience. The second book ended on a bit of a cliff hanger (you know, with the end of the world and all that.) I’m excited about the next installments. I cannot wait to see what the author has in store for Hylas and Pirra. Even though Talamon is now kinda evil, I’m pumped to find if he will keep to the promise he made himself at the end of book 2. 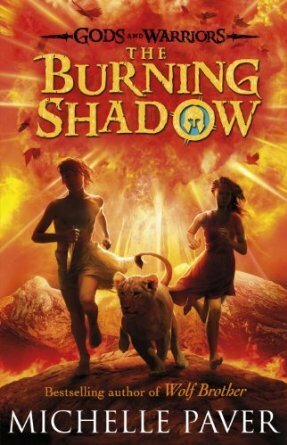 Sign into Goodreads to see if any of your friends have read The Burning Shadow.